By Z-Man Games detailed calculations, more than 2.5 million additional games could be played each year if you took less time picking a start player. 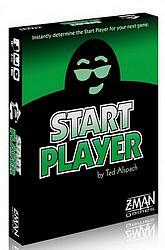 Start Player solves this problem: Just turn over a card and you’ll know who the start player is. Maybe it’s as simple as the tallest player, or the player with the most unbuttoned buttons. It’s the most comprehensive system ever devised for choosing who starts a game.